Raging Waters, Northern California’s Largest Waterpark, offers 23 acres and a million gallons of family fun and attractions. 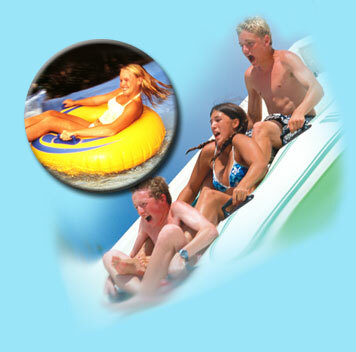 The park features thrilling high-speed slides and family attractions like the 350,000-gallon wave pool. Water features include the Activity Pool – an interactive water play area for the entire family; Barracuda Blaster – grab 2 friends and barrel down 500 feet of splashy twists and turns ending in a plunge into the pool below; Blue Thunder/White Lightning – Riders bolt through an electrifying 60-feet of twists and turns sliding straight into the pool below; Dragon’s Den – You’ll catapult through mysterious darkness and then plummet into the mist-shrouded abyss of the dragon; Endless River – Enjoy a relaxing journey floating down the river through waterfalls and streams; Little Dipper – Kids have fun in their own bubble pool, complete with junior gang slides and a waterfall; Pirate’s Cover – Climb cargo nets and shoot water cannons in this interactive water play structure complete with a 40 foot mast topped with a water spilling pirate’s skull … and so much more! Raging Waters, San Jose is located inside Lake Cunningham Regional Park in San Jose . The park is easily accessible from the 680, 280 and 101.